The Dual Mode TDR is capable of finding faults (Opens, Shorts, Arc Faults) on fully energized cables up to 600 Volts. Arc Chaser can monitor live cables for intermittent conditions, capturing these “events” and reporting where and when they occur. Using advanced Spread Spectrum Time Domain Reflectometry (SSTDR), Arc Chaser is capable of accuracy to fault of better than 1%. Meets full international requirements for working on energized cables. 8-10 hours of continuous use. Stay up to date with cable settings, features and enhanced software upgrades. Arc Chaser will run with wall power down to 4V, however batteries will not charge unless input voltage is greater than 10V. Totex battery pack, with four LIO Rechargeable Cells. Full screen brightness, dynamic test, 7.8V battery: 335mA. Low power – 70mA, assuming full charge of 5000mAH, 71 hours. SSTDR stands for Spread Spectrum Time Domain Reflectometry, which is LiveWire's patented technology. The technology reduces maintenance, troubleshooting, and/or monitoring costs, increases system reliability, and can extend the useful life of systems and structures by providing accurate monitoring of system health environments. 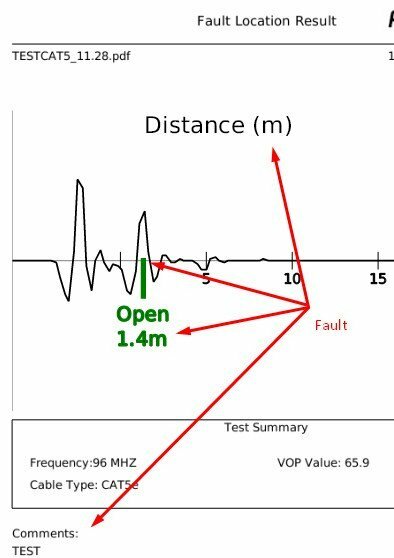 On the other hand, Time Domain Reflectometry (TDR) methods were not able to locate the tiny intermittent faults left after an arc fault event because the impedance discontinuity was too small to create a measurable reflection. LiveWire recognized this lapse in technology and determined that if an electrical fault could be found during the few milliseconds the arc occurs, it would be an actual short circuit which returns plenty of reflected power! This is the concept that led to the development of SSTDR at LiveWire. 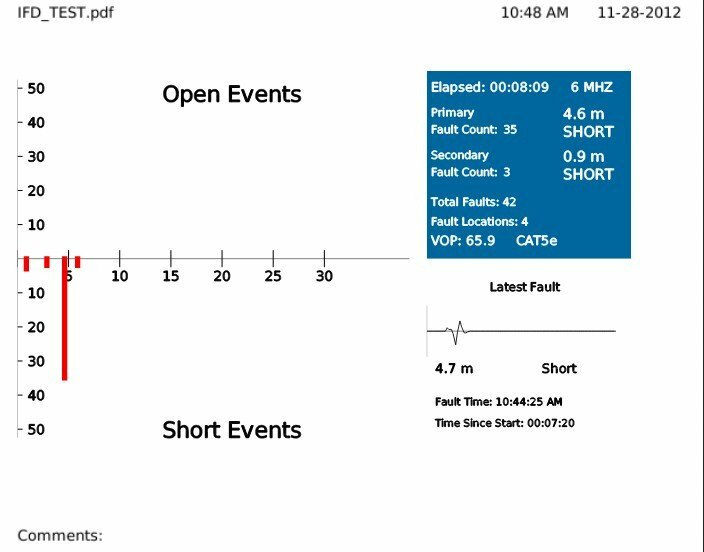 Gives you Quick picture of existing cable faults and condition, and shows the distance to shorts or open faults at the same time. Be able to test multiple kinds of electrical faults up to 12,000gt. 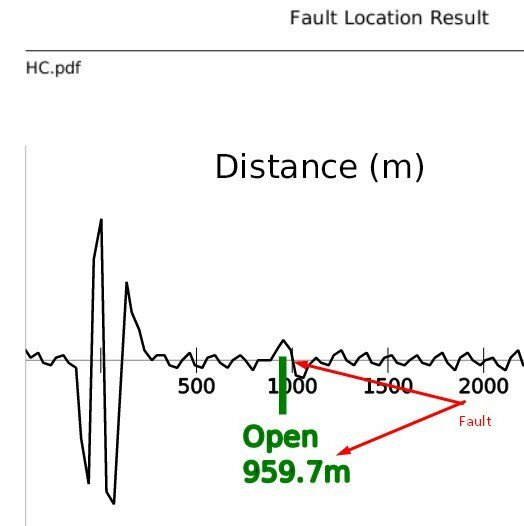 Locate shorts, open,and intermittent arc fault with accuracy to fault of better than 1%. 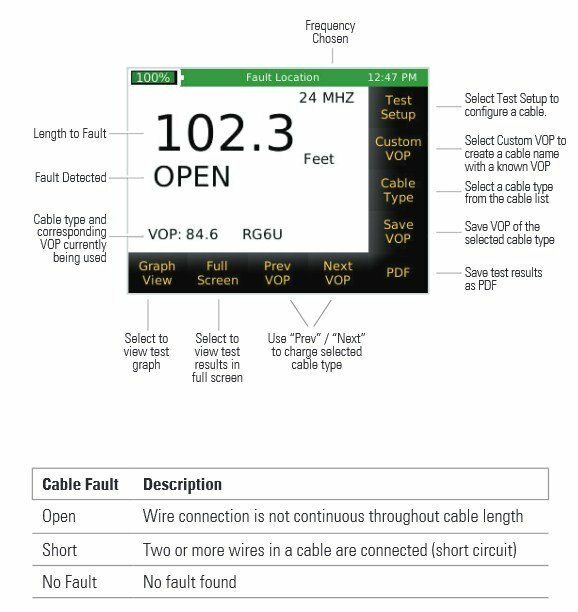 Input VOP values or choose the cable type in the system menu, and get the length of cables in no time. Be able to measure coax, Cat6, and any other twisted cables. The test system can pinpoint and record the location of these conditions on both live(operational) and dead systems. As a result, discovering cable events which can only be shown under load has become possible and easy, and the wiring maintenance crews can quickly locate and repair wiring damage, reducing maintenance costs and maximizing operational readiness. Being able to test on live(operational) and systems, the device is capable of finding faults (Opens, Shorts) on fully energized cables up to 600 Volts, which also means that it can Meet full international requirements for working on energized cables. Field work can be really time consuming and tiring, and we understand that it is annoying to find that your device power is out or need to change batteries during the working process. With 3rd generation rechargeable lithium ion batteries, the device is capable of 8 to 10 hours of continuous use. Saving and transferring your testing datas can never be more easier.With the Kingston SDHC class 4 SD card in the device, you can save all the data sheets in it, and transfer them into your PC when you need to, just like using a digital camera. There are many lighting environments in the field, and we understand that the traditional screen display can be so difficult to view in such environment. With full color screen display, it is much more easier to navigate your device in all lighting environments. To make it more intuitive to operate the device, touch screen is applied. No more struggles with the buttons, the touch screen function makes it easier and faster. 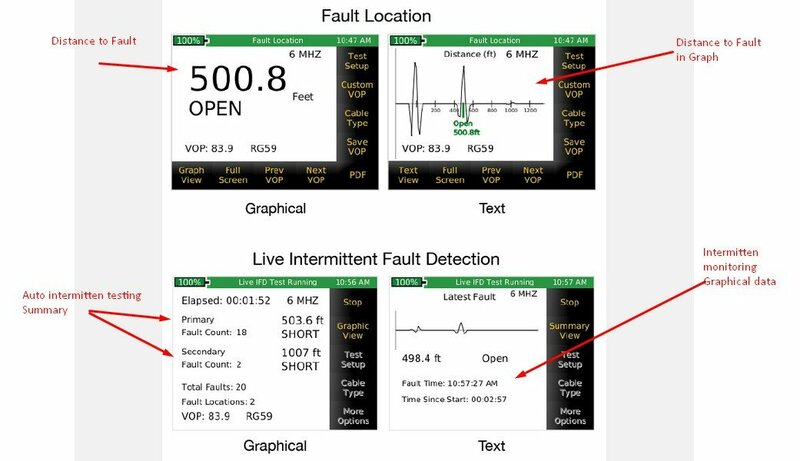 Detect, locate, and characterize cable faults, with ability of continuous monitoring for intermittent faults. 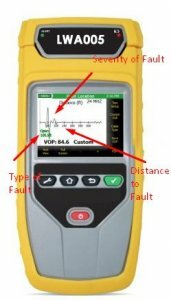 Every type of cable has different VOP value, and test frequency. We have all the most common setting values in the device, so all you have to do is click and choose the type of cable and the right value set. There is no need for memorizing the or looking up for numbers, let the device help you and save your time. To make the device more user-friendly, we provide not only text format but also graphical result of the tests. Both the results can be transferred into PDF file and saved into SD card. The result can be transferred into PDF files right after the testing process. On the device, you can easily type and edit the name of the file, leave comments, and the date&time will automatically be saved in the file as well. In other words, once your field works in done, your paper reports can be finished at the same time, all you have to do is go back to the office and print them out. Built in tone track function helps you to trace the signal of cables without the need of other extra equipments. With this function you can easily find the cable that you test on among the complex cable systems, save your time for the main issue and acquire better working efficiency. ．Upgradeable Firmware：Stay up to date with cable settings, features and enhanced software upgrades.